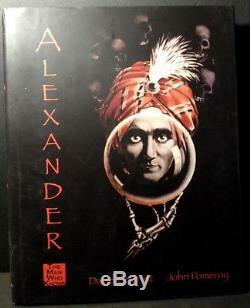 Alexander: The Man Who Knows by David Charvet and John Pomeroy, very good. Throughout this book, two very different stories unfold. First there is the account of Claude Alexander Conlin, the man who became perhaps the highest paid entertainer in the field of magic. Starting out as a stage illusionist, Alexander eventually discarded the large props and relied on his tremendous skills as a showman to put over an act of mentalism and psychic readings. As the turbaned Man Who Knows, Alexander earned four million dollars over the course of a relatively short career during the 1920s. The second story that runs concurrently with Alexander's theatrical career includes details on his seven marriages (sometimes to more than one woman at once), time spent in local jails and federal prison, his trial for attempting to extort an oilman millionaire, his failed attempt to out run the authorities in a high powered speed-boat loaded with bootlegged liquor, and the four men that he admitted killing. It is not the kind of story in which you expect to find names like Harry Kellar, Dr. Wilson, Harry Houdini, Servais Le Roy, Howard Thurston, Floyd Thayer, Joe Dunninger and Harry Blackstone but here they are, both friend and foe alike. Mike Caveney's Magic Words 2004, illustrated, dust jacket. The item "Alexander The Man Who Knows by David Charvet and John Pomeroy, very good" is in sale since Tuesday, October 2, 2018. This item is in the category "Collectibles\Fantasy, Mythical & Magic\Magic\Books, Lecture Notes". The seller is "szaut_szaut" and is located in Albuquerque, New Mexico. This item can be shipped to United States.